Gioacchino D’Aiello first appears in the Painesville, Ohio, area in 1915. In America, Gioacchino D’Aiello was known as Jack Daiello. Gioacchino D’Aiello, son of Salvatore D’Aiello and Girolama D’Aiello, was born on July 26, 1909, at Palermo, Sicily. Gioacchino died on July 22, 1952, at Cleveland Clinic Hospital, Cleveland, Cuyahoga County, Ohio, at age 42, of an acute pulmonary edema. His body was interred at St. Mary Cemetery at Painesville Township, Lake County, Ohio. Gioacchino D’Aiello, age 5, immigrated to the United States on March 11, 1915, travelling to Painesville, Ohio. He immigrated with his mother and sister, Giuseppa D’Aiello. 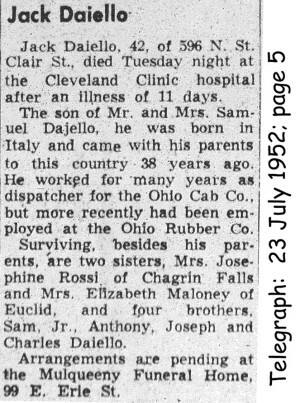 They were joining Gioacchino’s father, Salvatore, in Painesville. Gioacchino, his parent’s, and sister, Giuseppa, returned to Sicily in 1922. He re-enters the United States on October 6, 1923, with his mother and sister. His father returned to Painesville in March. 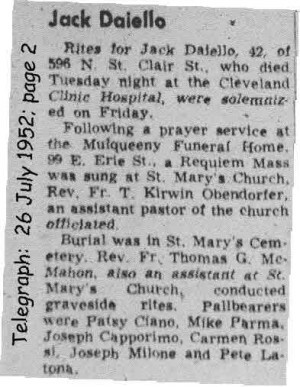 At the time of death, Gioacchino resided at 596 North St. Clair Street, Painesville, Lake County, Ohio. Gioacchino never married.